In his capacity as Director of Chamber Music, Krommer wrote a very large quantity of Chamber Music, including: 26 String Quintets (for 2 violins, 2 violas & cello); 83 String Quartets (for 2 violins, viola & cello); 2 Bassoon Quartets (for bassoon, 2 violas & cello, op. 46 in 1804); 2 Piano Quartets (for piano & strings, op. 95 in 1817); 13 Pieces for two Clarinets and Viola (op. 47, 1804); a Clarinet Quintet (for clarinet, violin, 2 violas & cello, op. 95); and 5 Clarinet Quartets (for clarinet, violin, viola & cello: two as op. 21 in 1802, op. 69, op. 82 in 1816 and op. 83). 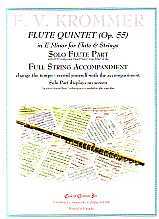 Of most interest to us, of course, are the Chamber Works for the Flute: 9 Flute Quartets (for flute, violin, viola & cello: op. 13 in 1798, op. 17 in 1799, op. 59, op. 75 in 1808, op. 89 in 1820, op. 90 in 1820, op. 93 in 1820, op. 94 in 1820 and op. 97) and 9 Flute Quintets (for Flute, violin, 2 violas & cello: op. 49 in 1804, op. 55 in 1805, op. 58, op. 63 in 1808, op. 66 in 1809, op. 92 in 1823, op. 101 in 1820, op. 104 in 1821 and op. 109). It can be observed that Krommer was not very careful with his use of opus numbers; there are two totally different works for each of the opus numbers 69, 83 & 95. - 4th Movement (2/2, Allegro moderato, half = 72).